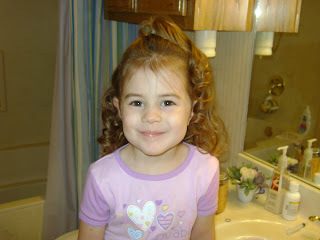 I think I will go back and get the medium rollers instead of the tiny ones. But as I predicted, by lunchtime, most of the curls had fallen out. It's just the hair we were given! But it still might work out for a Sunday morning every now and then! She is such a doll. So hilarious. Love these pictures. Cute! I remember the sponge roller days. I'm surprised she slept with them alright without them bothering her. Oh, I spent SOOOO many Saturday nights in those things, tossing and turning because I couldn't get comfortable! They always stick you in the head! 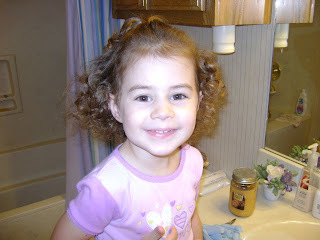 She looks soooo cute, the pain was always worth it for me, Love those CURLS!! So cute! 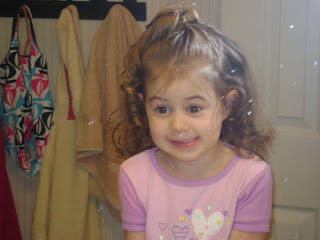 I remember those days - I loved having curly hair for um about an hour! !